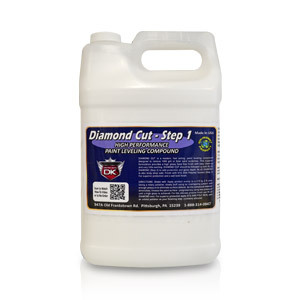 Diamond Cut High Performance Paint Leveling Compound (Step 1) is a modern, fast acting, body shop safe, car polishing compound designed to remove 1000 grit or finer sand scratches or other correctable paint blemishes. This superior formulation provides a high gloss, haze free finish with easy clean up and very little swirling. Almost no dust, and no swirls – and YES it’s a Compound! This is the most advanced compound Detail King has ever offered, and it has a pleasant orange citrus scent. Diamond Cut should be followed up with Blue Diamond Polish (Step 2) to add protection and additional gloss. Blue Diamond is also body shop safe to use. For a superior shine and long term protection that can last up to 12 months or even longer apply STS 3000 Polymer Paint Sealant (contains silicone) as the final application (Step 3). We offer all of the above mentioned products as a kit available in pints, quarts and gallons – High Performance Paint Leveling and Protection Kit. Watch our 3 Step video to learn more about what a great product Diamond Cut really is. If your auto detailing business caters to high-end automobiles, these are the polishing products that you should seriously consider adding to your arsenal. Car enthusiasts you will love these too!